ରାଷ୍ଟ୍ରାଦର୍ଶ : "Ubumwe, Umurimo, Gukunda Igihugu"
↑ National Census Service 2012, p. 16. ↑ ୩.୦ ୩.୧ ୩.୨ ୩.୩ IMF (II) 2013. 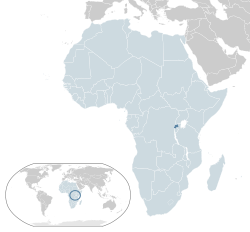 The Republic of Rwanda (official government site). Rwanda from UCB Libraries GovPubs. Rwanda profile from the BBC News. Rwanda Tourism (official Rwanda Tourism Board site).